Relationships are hard to deal with! One needs to put in a lot of time, effort and patience in order to nurture a relationship. Having done what one can do in his time and space, doubts and fears still remain. Each human being has their own sets of experiences, conditioning and innate philosophies that make them who they are. All of these factors also play pivotal roles in love life. The stars, the sun, and the moon also have impacts on what a person fears, and acts on in a relationship. In simpler words, the zodiac signs matter. 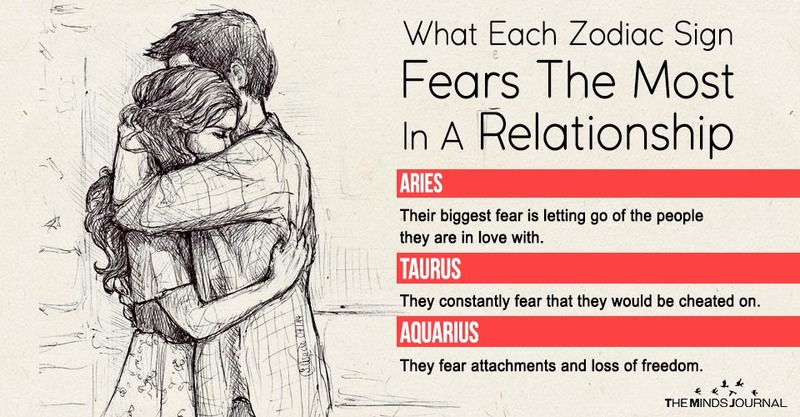 Read on to find out what fear a person of a particular Zodiac sign in a relationship might have. The Aries love too fast and too hard. They are not very adaptable and they take a lot of time to get used to new things. Thus, it is very difficult for them to move on from an ongoing relationship. Their biggest fear is letting go of the people they are in love with. This earth sign values loyalty with a ‘T’. They are introverts and they do not easily open up to people. They take a lot of time to venture into a relationship. And even when they do that, they do so with their one eye open! Meaning they are always stressing about who their partner is dallying with. They constantly fear that they would be cheated on. The Geminis are known for their charm and sociability. By nature, they are free spirits and they do not conform to the societal tags and rules of love and relationship. They fall in love too often too many times! However, from inside they are not sure what they want, and so when in a relationship. They fear will they be able to hold on this relationship? The Crabs are sweet, romantics and givers. When in love and relationship, they get hearts in their eyes. They expect a movie like romance with all the songs and dance. They fear that they will be ignored or not appreciated in the relationship. The Leos love to be loved. Whether in a relationship or not, they like to have the center stage in whatever they do. Switch off the spotlight from them and they will be ready to roar! Their this characteristic in a relationship translates to the fear of being ignored from their partners. The Virgos are dependable and trustworthy. They have very high standards and one slip from their partners will make them irritable. However, from outside they will appear completely unfrazzled. From inside they will fear for the slightest of thing that may wrong. It may be something as trifle as their partner buying them the wrong shade of shoes! The Libra sign is associated with marriage and stability. They are beautiful and social. This air sign though is highly social and certified flirts in the list of the zodiac, but unsurprisingly they hate to be alone. They are the most stable (or in their case balanced) when they are in a happy and cheerful relationship. From within they are very insecure. They do not take heart breaks easily and their biggest fear is that their partner will leave them for someone beautiful and richer making them all alone in the big bad world.